The 1990 6 Cylinder Honda Goldwing GL1500 has lots of extra add-ons, chrome, berry wine paint and is in excellent condition for an old motorcycle. It has a new battery and comes with the original service manual. This old girl will make someone a fine bike and when you check you will see that I'm offering a very good deal on her. and then if you have questions regarding the '90 GL1500 or if you would like to make an appointment to view it you can do so using the space below this classified. 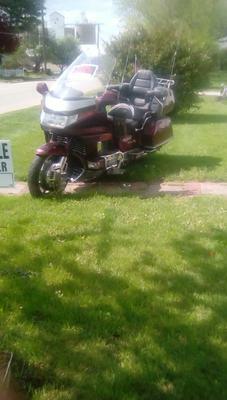 The 1990 6 Cylinder Honda Goldwing GL1500 is in Rushville IL USA and I'm asking $3800 to be paid in cash only. Call me (serious callers only) at (no e-mail or texts)30nine-338-6six31 and mention that you found this nice, old Honda motorcycle on GoGoCycles Used Motorcycles for Sale .